I managed to pick up a few laserdiscs on the cheap today. Its been years since I set up my LD player to my TV as I mainly use it for CDs. I have heard many mixed results on LD vs. DVD on which is better. So, I'm wondering, is it worth it to get more stuff on laserdisc? If so I'm going to be looking for bargains and if not I guess I will stick to either DVDs or digital downloads. Wow laserdisks.. I threw away thousands of dollars worth of laserdisks as 'junk' as soon as i saw a DVD picture. The resolution of a laserdisk is only a little higher than a VHS tape. Maybe like S-VHS. Theen the everpresent red color issues in laserdisc playback. (for some reason the devices had a tough time with getting red anywhere near right, and a solid red usually has huge artifacts in LD playback. Now I have thousands of DVDs, and am not goint to BluRay anytime soon. So I have my limits too. If you think the laserdisc is an investment.. LOL no way. But if they make you happy then go for it. Rhett, Jarleboy, jjjos and 1 other person like this. Unless it's for some special thing you have to have that was never released elsewhere I'd think it would be insane to spend money on a Laserdisc in the 21st century. goodiesguy, Disraeli Gears, Gaslight and 11 others like this. That is truly the voice of reason. The only reason I can think of for buying any Laserdiscs today would be for the handful of extremely rare titles that have value as collectors items. Any major feature film has most likely been reissued on DVD and will look and sound substantially better there or on Blu-ray. McLover, goodiesguy, jeffrey walsh and 8 others like this. The first laserdisc i remember was AbbA Hits around 1981 dispayed in a av shop. I have a couple of rarities: the withdrawn Bad Lieutenant  with Schooly D/Led Zep 'Signifying Rapper/Kashmir' soundtrack. I had this converted to DVD. Also of interest is The Godfather Trilogy box set that has all 3 films re-edited in chronological order with added scenes; pretty sure this still isn't available on DVD? I would love a copy of Tin Machine's 'Oy Vey, Baby' if anyone is selling?! If you are a collector of Antique technologies that hold no advantages at all, and like nostalgia, for sure..
Rhett, SBurke and Larry Geller like this. There are some performances on laserdisc that are not available on dvd (or vhs), like Billy Joel's "Live From Long Island". clhboa, dbsea, Grootna and 5 others like this. I agree. I have about 300 LaserDiscs, and the only reason I was keeping my collection was for the original Star Wars films (1991 ish releases, that's when I bought them), though I just got the Premium Editions on DVD which have the original theatrical releases as a bonus feature. Sadly, they're not anamorphic but even zoomed on my 60" plasma (which can zoom and maintain the correct aspect ratio) they look better than the LDs. Now I just have one film on LD that somehow hasn't yet made it to Blu-ray: The Russians are Coming, The Russians are Coming! There is a DVD, but I really don't want to pay $70+ for it. What Beatles titles were on LD ? Well, 3 titles that I have that never made it to DVD are: Let It Be, The Compleat Beatles and the Live! BBC 8". Shak Cohen and alexpop like this. How's Let it Be picture/sound wise ? There's still loads of laserdiscs out there with bonus features and commentary tracks that were never ported over it to later editions. For films, you'd need them in addition to the DVD or Blu-Ray, but not instead of. As far as music titles are concerned, though, there are quite a few with much better audio than the DVD reissue. Picture: 4X3 cropped=crap. Sound: analog mono=crap. By FAR the best version of this ever released on any home video format. See the clips on Anthology to see what it really should look like. The '66 Budokan Concert was also released on LD in Japan. A tough one to track down. LaserDisc junkies, you ought to check out www.lddb.com and also Facebook to notice that there are still LD junkies out there. Well then, it looks like I'm going to stay away from laserdiscs. And if anyone is wondering, the ones I got are Superman The Movie Part 1, 2 and 3 all for $5. Some flat panel TVs do display LDs very well, others don't. I am willing to take those Superman LDs from you. Bingo! There are still a few holdouts, but overall, almost everything I had on LD has surfaced on DVD. Another poster mentioned various bonus features that did not make it to DVD. If I had such disc, I'd burn it over to DVD and tolerate the sub-DVD picture quality. I never could understand why Compleat never made it to DVD. Not the greatest doc, but a really nice one. LIB - we're still keeping fingers crossed. As for the quality of LIB - mono sound and picture cropped to hell. Now here's something ancient - I'm still looking for a better copy of Rod Stewart Live From The L. A. Forum(not the one with Tina Turner). That was one hell of a show. The only thing I've seen is a VHS that is edited down to 60 minutes. I used to have the show on (gasp) RCA CED disc. Laserdisc vs. DVD? In 2014? This cannot be a serious question. vegafleet, DLD, Prophetzong and 2 others like this. 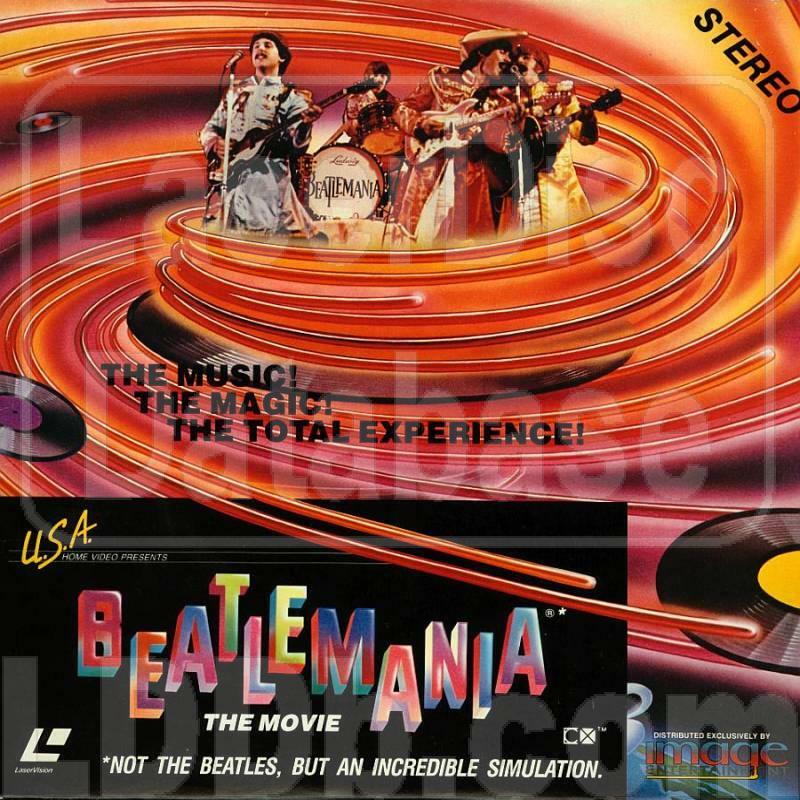 Also, Beatlemania: The Movie could be considered a Beatle title. It's doubtful it will ever show up again on any format. How about welcome to the modern world....BLU RAY?? Laser disc has very mediocre picture, and why would anyone buy a DVD today when blu ray is so affordable, and looks far better?? Rhett, Jarleboy and Prophetzong like this. Got a few blu-rays and I know that LDs are not as good. But been the collector that I am, I was wondering if it would be worth it to get into laserdiscs, which I guess its not. And I do have to admit, the laserdisc looks pretty cool, at least to me. The voice of reason is telling me yes. But the hoarder inside is telling me no. Which voice do I listen to? I have heard that the Star Wars LDs are the best way to watch the original theatrical versions at the moment, otherwise Blu-Ray would be the way to go.